This special Award is presented for an outstanding contribution to the property industry. This might be a project, company or individual, or perhaps a combination of all three. There is a cliché that nice guys finish last – but in the case of Ann Minogue this is doubly untrue: Firstly because she is not a guy and secondly, because despite being one of the nicest people you could ever hope to meet, Ann’s is one of the first names that anybody in construction would call if they needed a construction lawyer: Because the BCO’s first ever female President is one of the best, if not the best, construction solicitor practicing currently. After graduating from Clare College, Cambridge, in Law in 1977, the keen amateur historian undertook Articles at McKenna & Co where her talent shone through and by 1985 Ann had risen to Partner. One of the key reasons behind the former pupil of Aylesbury Girls School’s meteoric rise was another in that long list of firsts – Ann effectively invented the Construction Management Contract. Sir Stuart Lipton was one of the first in the long list of property greats to recognise her talent and brought Ann on board at his Broadgate development. Whilst the 2012 City Property Association President says being selected was: “Just being in the right time at the right place.” most of her clients would say it was in recognition of Ann’s prodigious talent. In the mid to late 1980’s, at the early days of Broadgate, there were no standard legal forms and contracts for management procurement routes, so Lipton got Ann to formulate some. Her resounding success in this field set a precedent for all construction contracts for management procurement and her effectiveness saw her become one of the first women construction law specialists in the UK. Success at Broadgate saw the 2015 recipient of the City of London Law Society Life Time Achievement Award become Sir Stuart’s legal advisor of choice on all his future developments, including Stockley Park, Chiswick Park, and currently 22 Bishopsgate. As her career soared - with partnerships at Linklaters and Macfarlanes (where Ann still acts as a three day a week consultant) - so did the illustrious list of clients and projects. 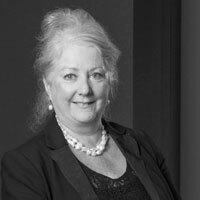 Ann has worked with the property who’s who – John Ritblat, Gerald Ronson, Godfrey Bradman to name a few and her projects included the Channel Tunnel, the Tate Modern and Tate Britain Projects, Chelsfield’s Hollandgreen and Knightsbridge Estate projects, the Royal Opera House and more recently 122 Leadenhall - the Cheese Grater. When reviewing Ann’s illustrious CV, it is difficult for many to realise the remarkable nature of the fact that all of this has been achieved despite the fact she is female. Thanks to the likes of Ann, the legal profession is now fairly evenly split between males and females – outside the partnership at least. But the property profession is nowhere near this. According to the Office of National Statistics just 9,000 of the UK’s 72,000 chartered surveyors are female. Throughout her career, Ann has had to sit in meetings, establish a position and represent clients, generally as the only women in a crowded room. As a trailblazer in her profession, and one of the most successful construction lawyers of her generation, Ann acts an inspiration for women and minorities in the profession. When Ann opened the 2006 BCO conference as President, less than one in ten delegates would have been non-white non-males – with much assistance from Ann, the 2019 conference, which will celebrate Diversity and Inclusion, will again be overseen by a female President and will be delivered to an audience where around 1/3rd of the delegates will be non-white or non-male. Those ‘minority’ delegates can look at Ann Minogue and see what is possible. Ann is an inspiration to so many and proof that if you have the talent and the drive you can have a successful career, a wonderful family and still be true to yourself. With her inert quality, steely determination and staying power, as a pioneer, an inspiration, a role model, a motivator and as proof that good ‘guys’ do finish first – Ann is the embodiment of the BCO’s core value – ‘excellence’. And that is why, in another career first, she becomes the only female recipient (to date) of the BCO President’s Award – something in which she is destined to be a trailblazer once more for others to follow in her formidable footsteps.